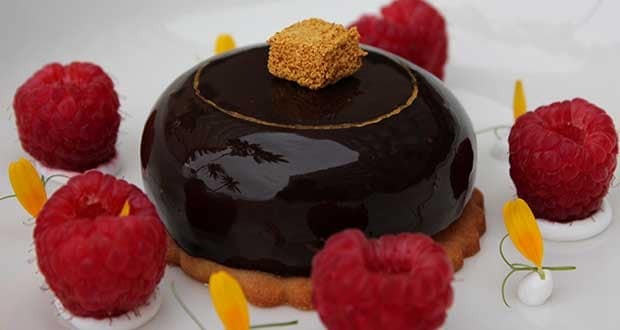 About Chocolate Marquise Recipe: A super rich chocolate dessert for all the chocolate lovers. You won't be able to resist this delicious dark chocolate specialty. 1.Whisk castor sugar, egg and egg yolk to a sabayon. 2.Fold through cocoa powder followed by the melted chocolate. 3.Whisk the cream with the coffee then fold through chocolate mix. 4.Set in moulds in the fridge overnight. 5.Make chocolate truffle with melting chocolate and warm cream. 6.Demould chocolate marquise and pour chocolate truffle. 7.Garnish and do plating with fresh raspberries. One of my favorite recipe ! It's heavenly tasty dish !